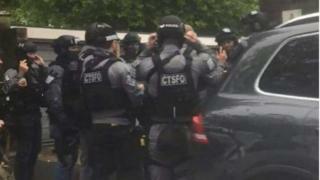 Armed police officers have arrested a man on suspicion of assault after raiding an address in Hampshire. The arrest at about 11:00 BST followed "concerns for a man's welfare" at a house in Florence Court, Andover, police said. Pictures posted on social media showed at least nine armed officers at the scene while ambulances waited nearby. A police statement said "there was no wider risk to the public" and the operation had ended. Police received a call reporting the concern for welfare at 23:45 BST on Sunday. The armed response was considered "appropriate and proportionate" because of the circumstances, the force said. The 47-year-old arrested man remains in police custody.